13 November 2018 – Today, CAPACOA announces the formation of its International Market Development Committee, a sector-led consultative and coordinating entity that will strive to develop opportunities for Canadian artists and enhance reciprocal exchanges with key markets. 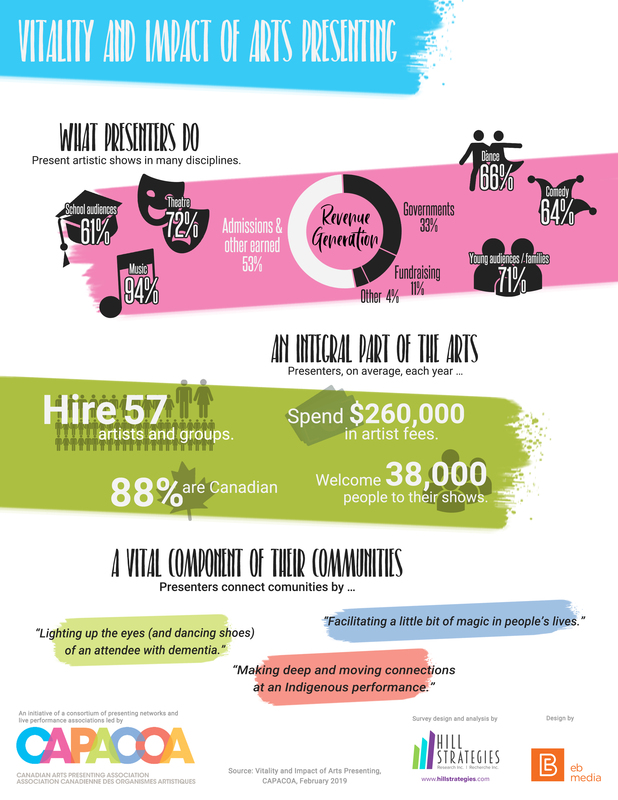 The performing arts sector, where diversity is celebrated and equity valued, continues to advocate for a pluralism of artistic voices that is reflective of the rich cultural fabric of Canada. To that end, the committee will work collaboratively across an international platform to develop opportunities for Canadian performing artists on international stages around the world. The committee recognizes the excellence of Canada’s performing artists and wishes to share their extraordinary voices with citizens around the world. By working together presenters, artists and their representatives will build relationships that open up markets and opportunities for international collaboration. Why now? Because as a diverse cultural community we have important lessons and truths to share with the world. In this divisive time in human history, we choose to share our stories of transformative discovery, profound learnings and joyous cultural celebration. The Committee will develop a national export strategy and take advantage of opportunities arising out of the Creative Export Strategy and Canada Council’s Arts Abroad program, as well as the pre-existing expertise and reciprocal trade relationships already developed by Canadian arts organizations and associations. By identifying key markets for reciprocal exchanges, and organizing joint trade missions to international touring and presenting events, we will ensure that together we are creating opportunities that will have far-reaching impact for Canadian artists and their publics. The members of CAPACOA and its partners will develop relationships between Canadian and international colleagues by fostering trust, on-going communication, and knowledge exchange amongst peers around touring and artistic collaboration from Canada and abroad. Trust-based dialogues and exchange of artists and knowledge in both directions will be the critical conditions for the sustainability of these new trade relationships and will ensure that there is reciprocity between Canada and other nations. As a first step, in October 2018, a delegation of eight presenters had the opportunity to attend the ENARTES conference in Mexico City. This experience included two days of programming for the four Indigenous presenters in the delegation to meet and network with their Indigenous colleagues in Mexico. In January, a delegation of seven will attend the Santiago a Mil Festival in Santiago, Chile to participate in PLATEA 19, a unique platform that affords the opportunity for people from around the globe to meet and network. The International Market Development Committee is made up of stakeholders from the performing arts sector who all have a broad range of international experience and contacts. Working in conjunction with the Indigenous Performing Arts Alliance (IPAA), and its Executive Director Cynthia Lickers-Sage, the Committee will be chaired by CAPACOA Board member Jim Smith, Producer at Eponymous and Artistic and Executive Director of Dance House. He is joined by International Market Development Consultant Judy Harquail and Norman Armour, Advisor and International Strategist. The International Market Development Committee was launched today during a reception in Montréal, at the closing of the 31th annual CAPACOA Conference, held in conjunction with CINARS and MUNDIAL MONTRÉAL. CAPACOA would like to acknowledge and thank the Department of Canadian Heritage for their support in launching this important initiative.